Wherever you go, you've got to try the wine! The French have long understood that a land's food is intricately tied with its identity, and one of the best ways to get to know a place is to enjoy its local food and drink. So, if you're interested in really getting to know Orlando, why not start with wine - a drink that relies on subtlety. Whether for a party, a romantic evening, or a peaceful afternoon, almost everything is made better with the right glass of wine. To maximize this enjoyment, you'll need a winery in Orlando that knows its wines inside and out and loves them as much as you do! If you want to try Orlando's wines, here are the wineries near Orlando, FL you should visit. The folks at Quantum Leap Winery have wine that is out of this world! Indeed, step in to their tasting room and you'll feel like you've been whisked away from Orlando into wine county. This establishment is great for people both new to and familiar with wine, as their samples will help you find something you enjoy. As a bonus, Quantum Leap is dedicated to sustainability - all their wines come from conscientious growers who are determined to minimize their ecological footprint. If you ever needed a reason to feel good about a glass of wine, there it is! Quantup Leap is on North Mills Avenue, and is easily accessible from I-4. This chain has become an exceptionally popular winery in Orlando! Top quality service offers up some of the best meals you can find in the city. Customers love how this establishment remains down to earth in its demeanor, with a real approach to wine that avoids pretention. As awesome as the wines are, they won't steal the spotlight - your meal will be equally exquisite, and perfectly paired. Cooper's is so excellent, it manages to stay open on the competitive Restaurant Row! This is also a great spot to visit if you're out in east Orlando, far from many attractions, as another location is open in the Waterford Town Lakes Center, near where FL-408 curves from east to north. This winery near Orlando is worth keeping an eye on as it just opened its doors and is near to the Disney area. Unlike the other wineries in Orlando, Formosa Gardens have fruit wine grown from their own crops! This winery is located on Formosa Gardens Boulevard, easy to reach from either FL-530 or FL-429. 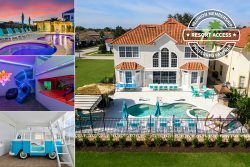 Reunion Vacation Homes remains at the top of the rental home industry! Call us at 1-855-453-5400 to learn more about how we can create your perfect vacation.